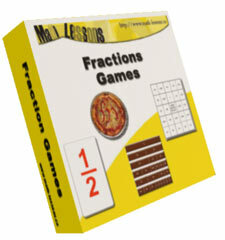 4 fractions games package . . . Equivalent Fractions Card Game — get kids to play with each other, having fun and learning fractions before they every know it! CAUTION: The excitement level can become very high! • Complete Instructions for the Teacher (rules, play etc.). Everything is explained and ready to use! • 42 printable fractions playing cards. Print out the cards, have students cut them out and you are ready to go! • Complete Package. Walk into the classroom and use it today! CAUTION: Once kids start playing — they cannot get enough! • Ready to use in the classroom. No preparation needed! Just walk into the classroom and use them today! Here is a great game for teaching fractions with chocolate bars. Students love this one. The underlying concepts are made visual and concrete allowing students to explore and discover for themselves! CAUTION: Allow plenty of time — students will want to keep playing! • Printable chocolate bars segmented into fractional pieces. Print them off and have students cut them and you are ready to go. • Complete instructions for the teacher. Everything is explained and ready to use. • Ready to use in the classroom. No preparation! Just walk into the classroom and use them today! Here is a great game for teaching fractions using food (which students love). Use to introduce and/or reinforce the concept of fractions. Visual presentation gets complex and counterintuitive concepts across quickly and easily. The color graphics allows students to discover and explore fractions themselves. Once they understand the basic concepts, or for a more advanced group, play fractions trading game! WARNING: You won’t able to stop at one game! • Printable pie and pizza graphics. Full color graphics. • Complete instructions for the teacher. No preparation! Just print and use in the classroom today! • Pie and Pizza Equivalent Fractions Trading Game, with complete instructions. If you are convinced then go ahead and order today! But don’t worry this product is completely guaranteed. Try it! It’s totally risk-free. Students become so involved they remember what they are learning. Designed to assist students discover and explore fractions for themselves. Students learn the concepts easier and remember them. Complete package. Everything you need is included. Complete instructions for Teacher. Everything is explained and ready to go! FREE BONUS #1- Fractions Word Find Game — This is a great exercise for students to practice the concepts of fractions and have fun! Included at no extra charge. FREE BONUS #2- Fractions Crossword Puzzle — Students can practice making fractions while doing a crossword puzzle. Includes answers. Included at no extra charge!